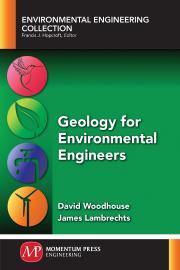 This book discusses the cycle that gives origin to the different types of rock and the geologic processes that produce the soils. On a macro scale, it seeks to discover the origin of Earth’s mountains, rocks, and a myriad number of other phenomena. On the micro scale, geology seeks to understand fluid flow through small pores and fractures. The fate and transport of chemicals through soils and especially through bedrock is a function of the geology and its understanding is a major factor in remediation design. David Woodhouse is a registered professional geologist with 50 years of experience in environmental and engineering geology. He has applied the principles of geology to the design of major engineering structures and, in the environmental field as a hydrogeologist and court recognized expert on contaminant flow, applied the same geologic principles. He was a consultant, reviewer, and principal investigator on numerous remediation and cleanup programs for the USEPA, the Department of Justice, and the various military branches. James Lambrechts is a registered professional engineer with over 40 years of geotechnical engineering experience and has written more than 60 professional papers. He is currently a professor of civil engineering technology at Wentworth Institute of Technology in Boston. In his geotechnical engineering work, he has dealt with a wide array of geologic settings on many major projects in the United States and Venezuela.